NOC Students are taking online and ITV classes at the Ponca Access Site. From left, William Rhodd, Reagan Cole, and Megan Merritt wrap up their American History class. 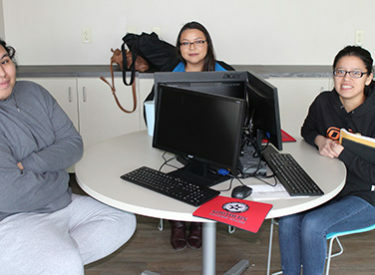 Three Northern Oklahoma College students are attending class via interactive television (ITV) at the Ponca Tribal Access Center. The Ponca tribal members are Reagan Cole, Megan Merritt, and William Rhodd. Reagan Cole works for the Ponca Tribe Education and Training Department and is completing her Associate Degree in Education. After graduation, she plans to attend Oklahoma State University and major in secondary education. Megan Merritt is a freshman majoring in Business Administration. She was a 2018 graduate of Ponca City High School. This is her first semester to take classes at the Ponca tribal access site. William Rhodd is the experienced member of the group. This is his second semester to take classes via ITV and online at the Ponca access site. Rhodd is a freshman majoring in Computer Science and is unsure if he will go straight to work after obtaining his associate degree or continue his education. The Ponca access site is funded by NOC’s Title III Native American Serving Non-Tribal Institute (NASNTI) grant. Each access site is equipped with three computers, an ITV screen, plus a video camera. The tribes suggested transportation to the Tonkawa campus, but the grant was not able to fund travel costs. As an alternative, access sites were developed at six area tribal educational centers. ITV classes allow students and teachers to interact in real time and see each other through video cameras located in the classrooms. Kruse added, “In addition to the access sites, the NASNTI grant is providing other academic services.” Last school year, one of 10 Native American mentors contacted all Native American freshmen students to provide guidance and encouragement. Over 66 percent of the Native American freshmen took advantage of academic mentoring. This school year, the Native American mentors are focusing on NA students who might need extra academic support. The mentors are working professionals from several different tribes and usually contact the students via email, text messages, and phone calls.